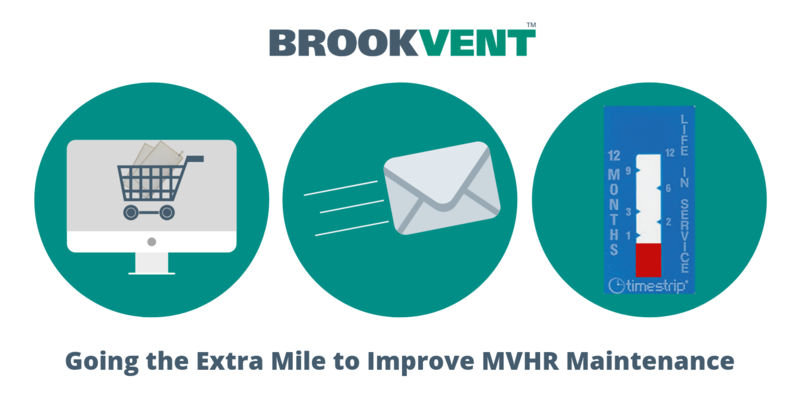 At Brookvent we have a wealth of knowledge in the manufacturing, designing and maintenance of MVHR systems. Through our own experiences in the market, we have come across and solved many problems and used innovative solutions to improve upon existing processes. However, one issue we continually come up against is poor maintenance. The simplest way to maintain an MVHR unit and ensure it’s working to its optimum efficiency is through regular filter replacement. The filters in an MVHR unit filter the warm, moisture-laden polluted air extracted from wet rooms, as well as the fresh air that comes into the home from the outside. They protect the heat recovery core and other mechanical components such as the fan blades and motor from dust, pollen, insects and other particles. They also prevent them from entering the air in the home, improving Indoor Air Quality. Due to the important role they play, filters should be checked after 3 months, 9 months and replaced after 12 months. In theory, changing the filters is a very simple task, but the reality is that many users aren’t aware this needs to be done and normally the MVHR unit is hidden away in a services cupboard or roof space. This means any warnings the system shows go unseen and aren’t addressed. Through conducting our own research based on how many units we have in the market and how many replacement filters were sold in 2018, we have concluded that 96% of users are either cleaning their filters manually or not conducting any maintenance at all. Through further field research, we believe the number of users who are not conducting any maintenance is approximately 75%. In the UK between March 2017 and March 2018 40,495 MVHR units were sold. Based on our findings, this equates to 30,371 homes that are not regularly maintaining their MVHR units. This is a huge number of residents being exposed to poor Indoor Air Quality and the health risks associated. We believe that this combination of actions helps remind users to change their filters and makes it easy for them to do so. All the filters on our website are pictured beside the correct unit and include the codes that are attached to the filter tabs. This makes it easy to correctly identify which filters are required. Once a user orders a set of filters, they can opt-in to our automated email service. This sends out a reminder to the user 11 months after their initial purchase reminding them to check or order new filters. The latest addition to this initiative has been the Timestrip, which is an easily interpreted, visible reminder with a 12-month countdown. The Timestrip offers something tangible which the user must interact with to activate. This interactivity combined with the fact that the Timestrip can be stuck to any surface often prompts ordering / cleaning of filters. All 3 of these actions have been in effect since September 2018 and during that time (Sept 2018 – March 2019) filter orders have increased by 98% compared to the same timeframe the previous year. This shows a substantial growth with a lot of customers re-ordering in order to maintain their MVHR unit. This is a huge step towards improving MVHR maintenance and ultimately indoor air quality in homes.